You know, cranberries are oddly considered a holiday item, although really, few fruits freeze so well, and should be readily available year round. Think peas, only redder. And tarter. As it is, BBQDude of the Great Western Casa McBardo has a heritage cranberry sauce recipe, and during my last visit, there was lots leftover. 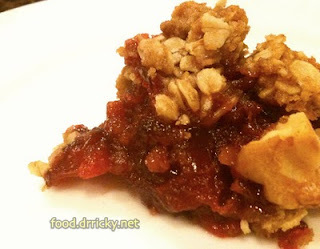 So I took my inspiration from an episode of Working Class Foodies, which was itself a collaboration with Cathy Erway of Not Eating out in NY, a great blog for cooking inspiration, and made cranberry/rosemary crumble. I must say, cranberry and rosemary do go very well together. The recipe is rather easy, forgiving, and the resulting bars keep well, taste great straight out of the fridge and will a glass of milk.